How startling. I'm sooo shocked. Imagine, the then Texas Commissioner of Agriculture praising Hilary Clinton for her "efforts in trying to reform the nation’s health care system” and daring to ask her to see what can be done to expand coverage availability to the rural population, ranchers, and agricultural workers. Really??? What a nightmare! Grow up people! Time to put you short-pants aside and start behaving like adults. Quit trying to create a mountain of scandal against Rick Perry out of these tiny little mole-hills. Have you no pride at all? This from the Daily Caller, an allegedly "conservative" publication by Tucker Carlson, a former conservative gone "David Brooks" on us. Texas Governor Rick Perry has been among the most vocal critics of President Obama’s health care reform initiative, and of Mitt Romney’s preceding health care program in Massachusetts. But in 1993, while serving as Texas Agriculture Commissioner, Perry praised the efforts of then-first lady Hillary Clinton to reform health care, a precursor to Obama’s health care reform efforts. Holy cow! Rick Perry actually had the temerity to make an effort to see to the needs of the people of rural Texas while he was the Commissioner of Agriculture of the state. How novel, how unusual . . . how very boring. Anyone reading this letter objectively, can see that it is not so much a "praise Hilary letter" as it is an attempt to ingratiate himself sufficiently to get his agenda--reformed healthcare for his rural constituency--improved. Very clearly his goal it to get the committee to look at the plight of ranchers, farmers, farm workers and rural community residents. "Hilary, your efforts to reform healthcare are a socialist abomination. By the way, would you do me a favor and please turn your attention to the difficulties our rural communities in Texas are experiencing in getting good affordable healthcare and insurance." Seeing as how Rick Perry was the Texas Commissioner of Agriculture at the time and part of his responsibilities was to assist those rural communities with any problems they might have, you would have to be fairly determined to see something objectionable in what he wrote. 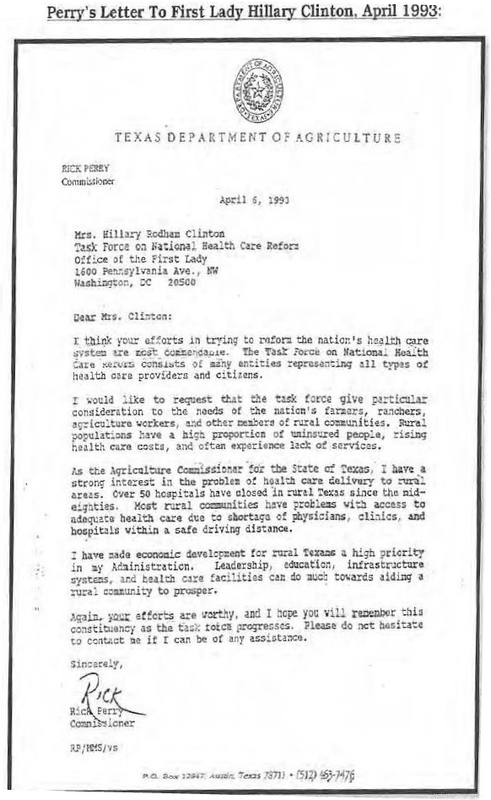 Only those with an anti-Perry agenda could read the letter as praising Hilary-care--especially since the letter was written in April of 1993 just 3 months after the healthcare task force was created and six months before opposition to their efforts--in the form of the "Harry and Loise" ads--solidified. Those ads didn't begin running until September of '93, after it became clear that what Hilary had been creating was not an improved healthcare system, but a socialized medicine program. Let's see, two sentences , the opening sentence and the first of the last paragraph--where he again calls attention to the plight of rural Texans--politely commending Hilary for her efforts in trying to reform the healthcare system and three paragraphs expressing his wish for the task force to pay close attention to the needs of the rural communities. I'd say that shows how absurd the accusations of Perry detractors are. This is a non-story. Everyone in America knew then and knows now that our health care system is on a one-way trip to Hell if something isn't done to slow the rapid growth in costs. Note, he didn't praise what she came up with, he praised her efforts, her willingness to take on a daunting (some would say impossible) task. This is a very sad example of establishment--inside the corridor/beltway, insular Northeastern pseudo-conservatives--searching desperately for something with which they can attack Rick Perry and stop his campaign juggernaut before it smashes the Romney campaign, complete with that Romney-care albatross he's got hanging around his neck. They are so afraid of being seen as "unsophisticated" or too conservative, that they would rather lie about Rick Perry than see him get elected. These are the same type of people who fought tooth and nail to prevent Ronald Reagan from being nominated, because (all together now) he was "unelectable." Funny thing is, some of these same clowns who are now living is terror of a Rick Perry Presidential campaign were probably out working as hard as they could to get Ronald Reagan elected. Now that they have become part of the establishment right, they have lost everything that made them conservatives. How pathetic that they are reduced to trying to create a controversy where none exists because they are unable to make an affirmative case for their used car salesman candidate "Slick" Mitt Romney. Smearing another candidate with lies or (in this case) innuendos, is faint praise for your integrity and for your chosen favorite. Guilt by association used to be a tool only liberals used.